From the great folks at Yay Bikes! Visit their website, support them, and join the fun at Columbus's number one bike forum! In the most joyous spirit of the holidays, Yay Bikes! thanks you for your kindness, patience, creativity, and generosity in 2009. Without you, Yay Bikes! cyclists wouldn't have celebrated a successful Bike to Work Week, opened an office, launched a new website, educated seven cycling instructors, provided Pedal Instead bicycle valet service at major events, helped Columbus attain the League of American Bicyclists' Bronze Award, and organized rides as diverse as Bike the Cbus and Night of 1000 Tacos! If you'd like to support the work of Yay Bikes!, there are several options in the left-hand column in this newsletter. But other (already-nonprofit) local cycling organizations could also use your help! Please read on to learn more about these projects and how you can help advance their missions with even a small donation. And stayed tuned for next month's newsletter, when we'll lay out a timeline for May Bike Month planning! Start thinking about YOUR contribution NOW! In 2008, the Blacklick woman now known as "The Bike Lady" organized an impromptu bike drive that collected enough cash, bikes and gear for 125 children of Franklin County Children's Services to wake up to a new bike from Santa! 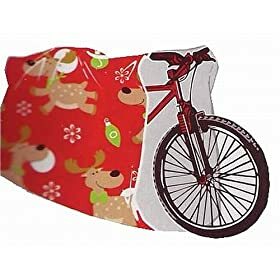 You can help The Bike Lady fulfill the holiday wishes of a vulnerable child this year with a cash donation - any amount is appreciated; $125 will get a child on a bike with a helmet and lock. Volunteers with The Enrichment Association's bicycle valet service parked an impressive 5,436 bikes this year (up from 3,871 in 2008!) for cyclists at events like Buckeye Football, ComFest, Latino Fest, and more. This year the team was also awarded the WTS International Innovative Transportation Solutions Award! Your sponsorship of or donation to Pedal Instead allows the bike valet to maintain its equipment and to attend events that couldn't otherwise afford the service. The primary goal of the Third Hand Bicycle Co-op is to promote cycling as safe and environmentally responsible transportation. The shop provides community members with the facilities and tools, and the skills and knowledge, to help make cycling an essential part of their everyday lives. Weekly open shop hours are Weds 6-9pm and Sat 12-6pm, with a Womyn/Trans night on Thursdays 6-9pm. Your donation to Third Hand helps with overhead during the winter off-season and with the purchase of tools.